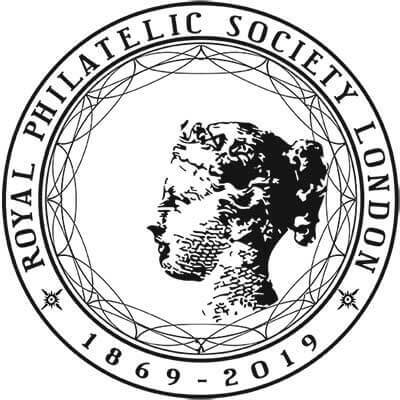 The Royal Philatelic Society London (RPSL), the oldest exhisting philatelic society in the world, celebrates its 150th Anniversary in 2019. The exhibition is a further milestone in the internationalisation of the Society. 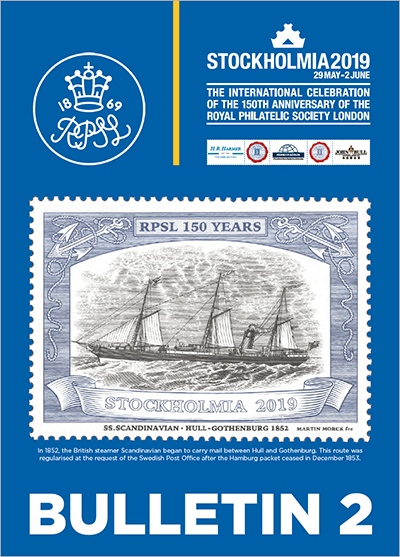 The only official international exhibition, whether competitive or non-competitive, will be that held in Stockholm as part of the sesquicentennial anniversary of the RPSL as STOCKHOLMIA 2019 – The International Celebration of the 150th Anniversary of the Royal Philatelic Society London. Read Bulletin 1 by downloading the bulletin from here. Read bulletin 2 by downloading it here. 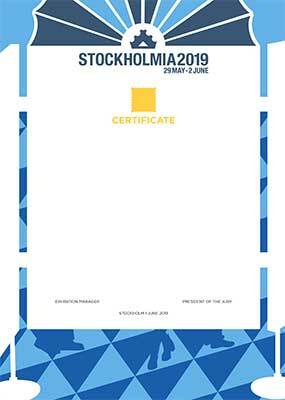 All exhibitors at STOCKHOLMIA2019 will be awarded the exhibition medal. The exhibition medal is designed and developed by Sebastian Schildt of Stockholm, a well-known Swedish contemporary jeweller and artist working in silver. 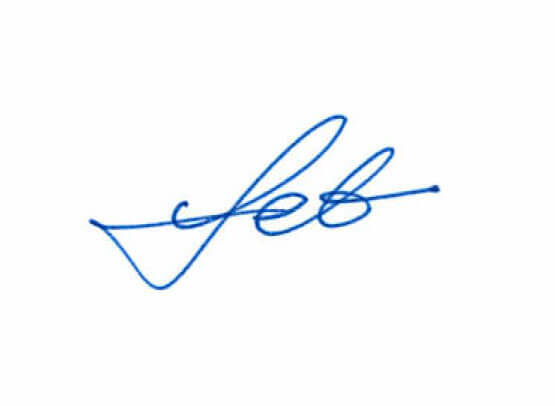 Sebastian Schildt and his signature for the Exhibition Medal. Photo Carl Bengtsson. Sebastian Schildt’s interest in design, arts and crafts was encouraged during his childhood while studying at the Waldorf School in Stockholm. At the age of 20, he was apprenticed to a well-known silversmith. In 1987 he started his own workshop, and since 2010 he has also his own gallery and showroom at Strandvägen 5 in Stockholm. The gallery is a venue for contemporary art, craft, and design, offering one of the country’s most exceptional selections of jewellery, works in silver, glass, ceramics and objects signed by some of our most recognised artists. 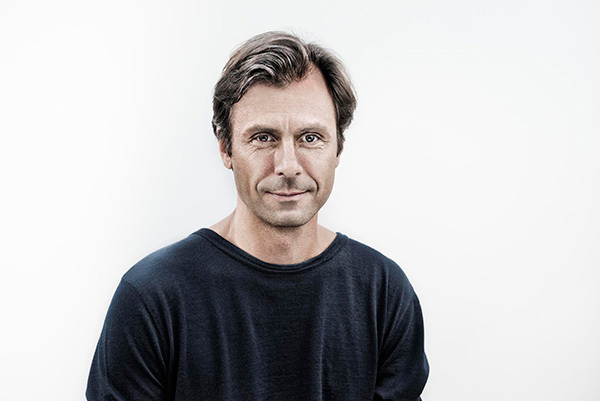 Sebastian himself is today recognised as one of Sweden’s leading modern silver and jewellery designers. 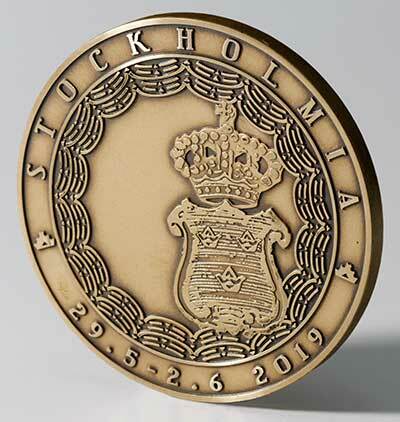 The unique STOCKHOLMIA 2019 medal in classic format and style, conceived as a double obverse, balancing the importance of Great Britain and Sweden to the exhibition through the depiction of two of the world’s most recognised stamps in a stylised contemporary design. The Penny Black (left) was the world's first adhesive postage stamp used in a public postal system. It was first issued in Great Britain on 1 May 1840 but was not valid for use until 6 May. 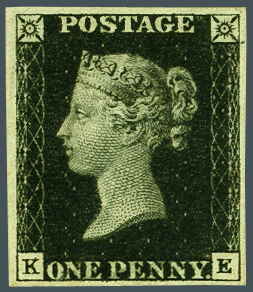 It features a profile of Queen Victoria taken from William Wyon’s City of London Medal of 1837, and the Coat-of Arms from another of the world’s best-known stamps, the Golden Colour Error of the 3 Skilling Banco, Sweden’s first issue. The exhibition medal is made in embossed bronze. Design and Project Management are by Sebastian Schildt, digital treatment by Nicklas Havaas and manufacture by Swedish Royal Warrant holders, Sporrong, in 375 examples. The diameter is 60 mm and thickness 4 mm. All medals are signed by Sebastian Schildt. Photo: Per Myrehed. 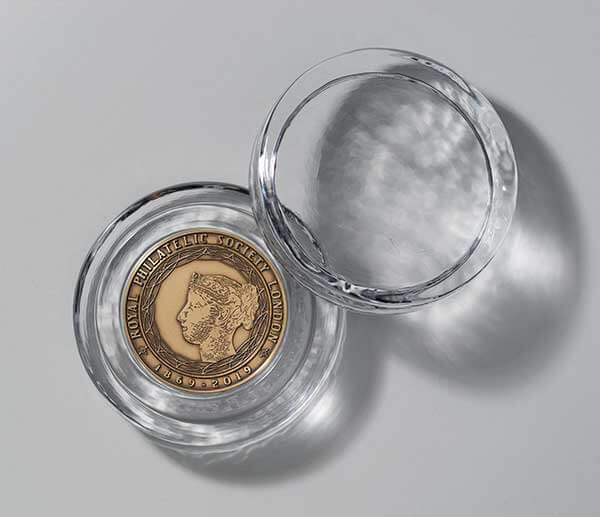 The STOCKHOLMIA 2019 medal will be presented to all exhibitors and other recipients in a glass case designed and developed by Sebastian Schildt, and manufactured by Skrufs of Sweden, founded in 1897. Photo Per Myrehed. Design by Mats Jonasson of Målerås of Sweden. Width 150 and height 175 mm in a limited edition of 299. STOCKHOLMIA 2019 comprises nine different competitive classes, or philatelic disciplines. The best exhibit in each of the nine classes will be awarded the BEST IN CLASS AWARD. 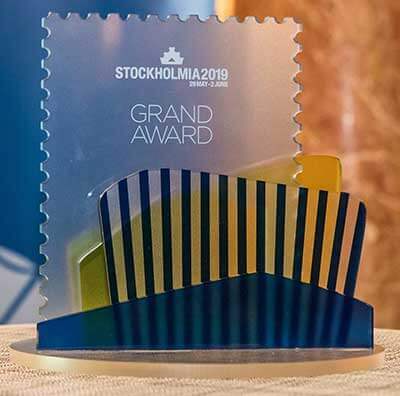 The STOCKHOLMIA 2019 GRAND AWARD will be awarded to the best exhibit in the exhibition. The nine candidates will be those awarded Best in Class. The winner will be selected by the judges at the Palmarès, in an open vote. 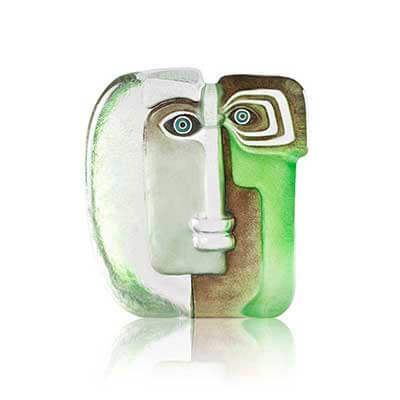 The unique STOCKHOLMIA 2019 GRAND AWARD is a three-dimensional solid glass trophy, based on the venue for the exhibition at the Stockholm Waterfront Congress Centre. 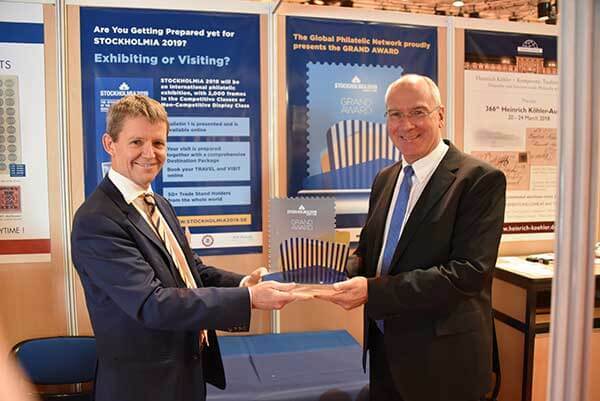 The GRAND AWARD was first presented at MonacoPhil 2017 by Dieter Michelson FRPSL (left) and Karl Louis FRPSL (right), directors of The Global Philatelic Network, Philatelic Partner to STOCKHOLMIA 2019. 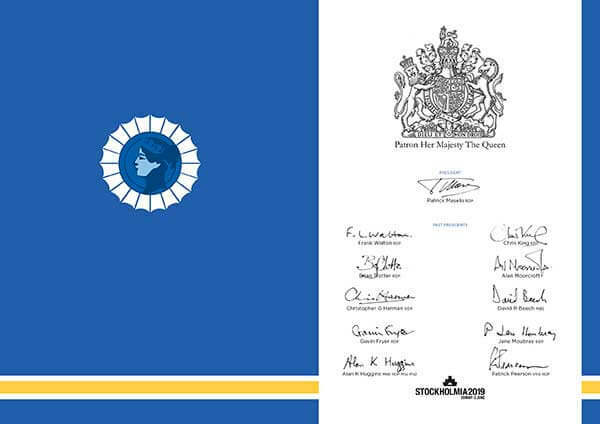 All exhibitors will be awarded the Exhibition Certificate, designed by STOCKHOLMIA 2019 graphic designer Maria Gadh, consisting of the certificate presented in a folder depicting the Royal Arms of Her Majesty Queen Elizabeth II, the Society’s Patron, and signed by the President and Past Presidents of The Royal Philatelic Society London. 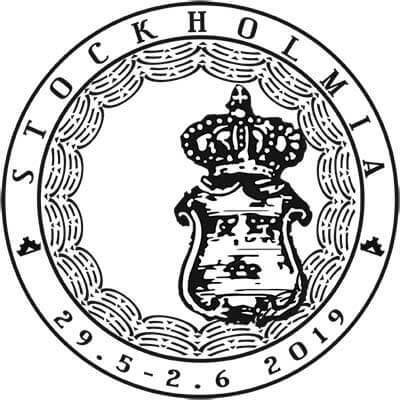 STOCKHOLMIA 2019 is the key international event around which the sesquicentennial celebration of The Royal Philatelic Society London is centered. Our sincere thanks are extended to those who have accepted their invitation to select the outstanding items from their collections, to be displayed in STOCKHOLMIA Court of Honour. 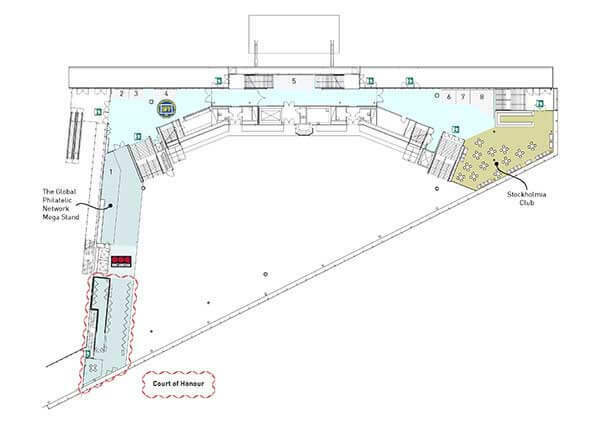 The Court of Honour is located to two areas of the exhibition, level 5 respectively level 3. 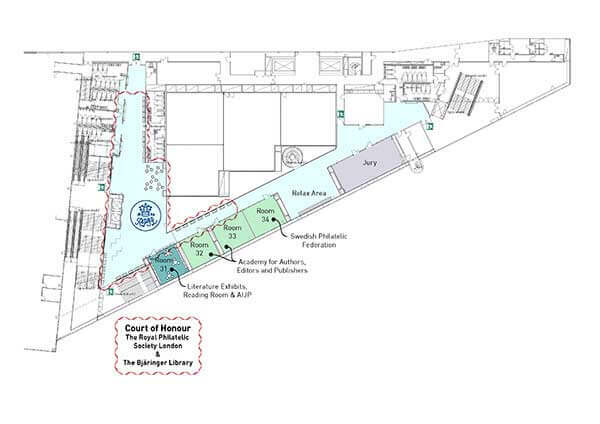 At level 3 the Court of Honour is co-joined with the STOCKHOLMIA LIBRARY and The Royal Philatelic Society London performances. 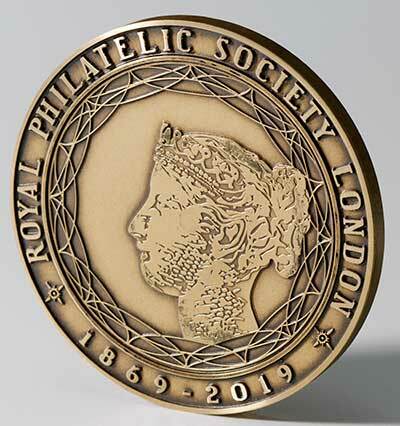 The Royal Philatelic Collection is delighted to be able to participate at Stockholmia 2019 in support of the Royal Philatelic Society London’s 150th Anniversary. Her Majesty The Queen, as Patron of the Society, was pleased to give her consent to the display. 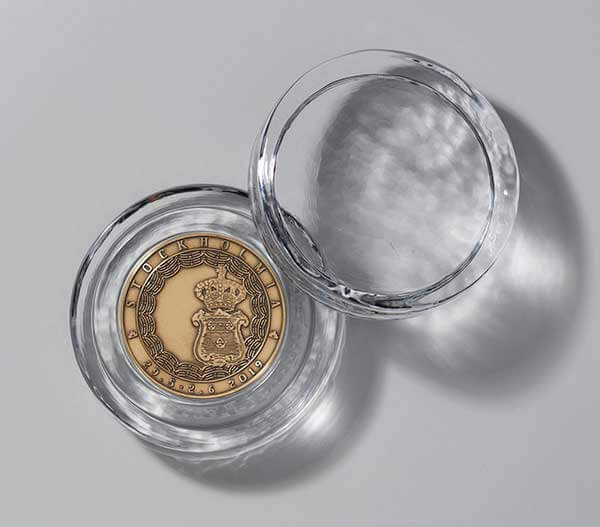 The “Kirkcudbright Cover” was purchased by Her Majesty in 2001 and bears 10 Penny Blacks used on 6th May 1840 – and perhaps can be described as the first day cover to end all first day covers! In the past, most members of Royalty received proofs and stamps with their effigy from their relevant postal authorities. Some were involved personally in philately and built up impressive collections. In this exhibit, the King, Queen or Prince concerned must have been personally involved in searching for specific items for his or her collection, or in one way or another have added to and improved a Royal collection left by another member of the family. Some kings were world renowned philatelists and their collections amongst the best of their time. Most of these collections have been sold or have partly disappeared over the years. Finding traces of them was certainly not easy. It is the foremost Gem of Swedish Philately and its absence cannot be ignored regardless of how many other items may be present in a collection. The fact that major collections of Sweden did not include it is not justification for disregarding it. They were the poorer for not having it among their Skilling Banco stamps, and indeed no comprehensive collection of Sweden built along modern lines has had the distinction of containing it. [Dr. Norman S. Hubbard in his foreword to the book ”Sweden Number One” (2005)]. 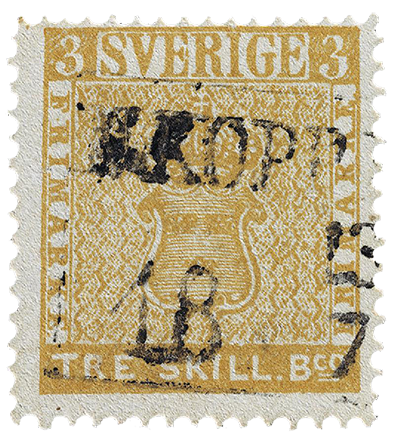 Since Gustaf Douglas acquired one of the most famous stamps "The Golden Colour Error, 3 Skilling Banco Yellow", he defines his collection as "The Golden Collection of Swedish Philately". 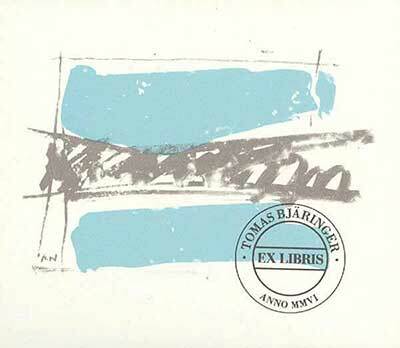 The collection derives from a lifelong collecting of the first 45 years of Swedish philately. The aim has been comprehensiveness but without deviation from the demand for best possible condition on all material included. The excellent condition is undoubtedly reflected by the material presented. Gustaf’s interests for geography, historical studies and in graphic art are reflected through the collection’s presentation. His expectations on the treatment and the presentation of the material are set high, and his wishes for a new and innovative approach is a driver for him in his collecting. Gustaf has not ignored the importance of the postage stamp, being the foundation and unifying force of the stamp hobby. Of that reason the balance between the number of rare stamps and the number of covers is quite pervasive. 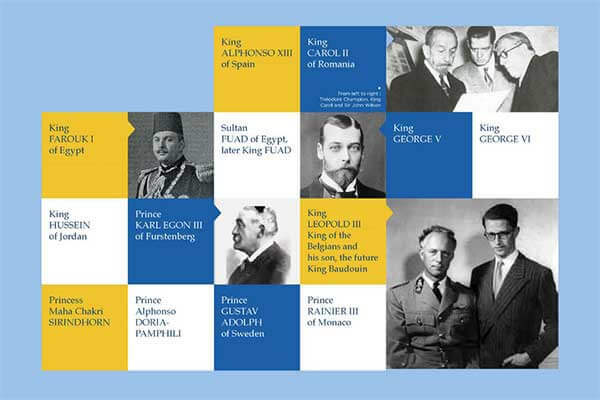 For this very special occasion, and Gustaf Douglas being the Philatelic Head Patron of STOCKHOLMIA 2019, the selection from "The Golden Collection of Swedish Philately" has been made to present the early stamp designs of Sweden, the introduction if the uniform postage rate, and the period reflecting 1855 to 1872. 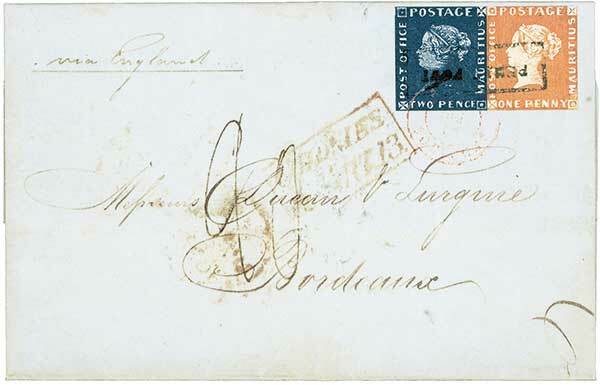 On 4 October 1847, the firma Edward Francis & Co. of Port Louis, Mauritius, confirms to their correspondent, the Wine Merchant Ducan & Lurgnie in Bordeaux, France, an order for 30 barrels of wine. This letter mail is posted via England with both the One Penny Orange and the Two Penny Blue stamps. Serious philately is inconceivable without creative philatelists, editors and their publishers. The program extends over four days with no less than approx. 55 individual events. 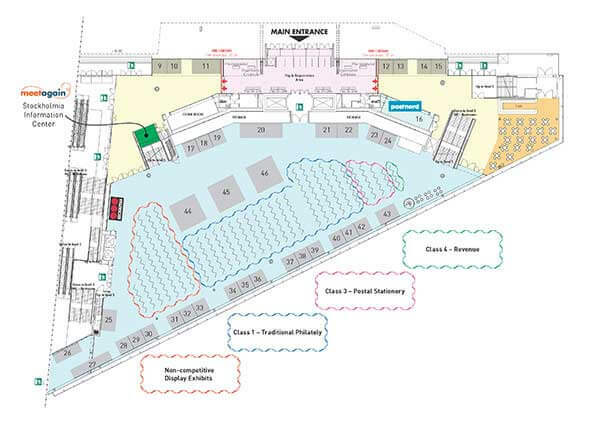 Well-known philatelists, connoisseurs and experts await visitors from all over the world at Level 3 of the Congress Centre in Room 32 + 33 for specialist lectures and PP presentations. 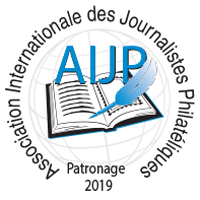 The program is organised by the World Association of Philatelic Authors and Journalists AIJP (Association Internationale des Journalistes Philatéliques). Under the leadership of its president Wolfgang Maassen, this rich program is put together. 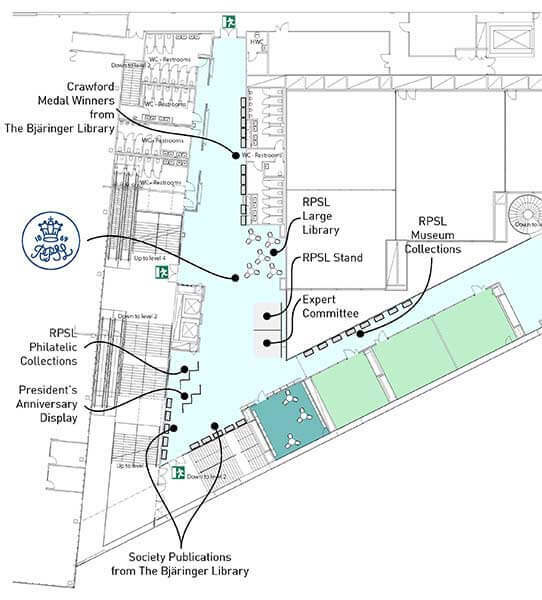 AIJP Secretary General Rainer von Scharpen is in charge of the reading room in room 31, where the exhibited literature can be viewed and reviewed. New Book Presentations (up to 25 minutes) of recently published philatelic literature. Insights into the world of renowned catalogues and trade journals. Lectures: Papers (sometimes up to 50 minutes) on subjects of importance to collectors, authors and publishers. Historical reviews of the development of philatelic literature in numerous countries. Everyone has free access to all lectures of the academy. Discussions with the speakers are welcome. 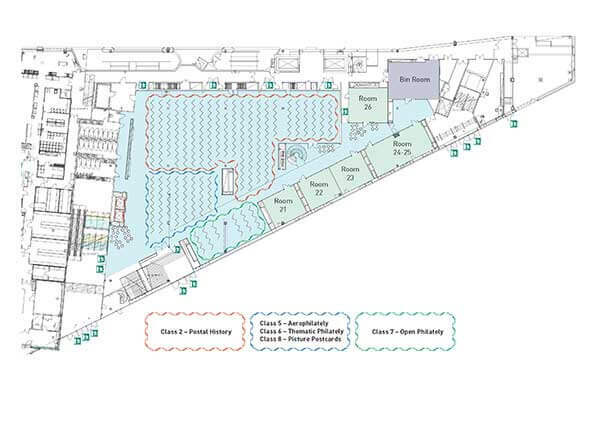 The two lecture rooms each offer up to 30 seats and are equipped with modern lecture media. Pre-booking is not necessary; seats are allocated on a first-come, first-served basis. 9101 "Adema, Kees, RDP FRPSL & Groeneveld, Jeffrey, FRPSL" NLD "The Paper Trail – World War II in Holland and its Colonies as seen through mail and documents"
9104 Auleytner, Julian, FRPSL POL "Postal Communications in Haller’s Blue Army 1917 – 1920 / Komunikacja pocztowa w Błękitnej Armii Hallera w latach 1917 - 1920"
9106 Beith, Richard, FRPSL GBR "Czechoslovak Forces in the United Kingdom from 1940: A historical and philatelic Study"
9110 Druce, Alan, FRPSL GBR "Perkins Bacon Great Britain Line-Engraved Postage Stamp Printing 1840–1846 (2 Volumes)"
9121 Hillesum, René / author: Axel Dörrenbach NLD "Deutsche Dienstpost Niederlande handboek en catalogus / Deutsche Dienstpost Niderlande Handbuch und Katalog"
9135 Kouri jr., Yamil H., FRPSL USA "Under Three Flags, The Postal History of the Spanish-Cuban/American War (1895–1898)"
9136 Liwendahl, Lars SWE "DALARÖ - en post och kulturhistorisk vandring under fem sekler / (DALARÖ - a postal and cultural journey during five centuries)"
9137 "Louis, Karl, FRPSL (exhibitor), author: Patrick Maselis RDP FRPSL" CHE "EDITION D'OR Vol. 42 - Belgium - Medallions 1849-1866 - The Patrick Maselis Collection"
9138 "Louis, Karl, FRPSL (exhibitor), author: Brian Moorhouse" CHE "EDITION D'OR Vol. 50 - Haiti - The ""Liberty Head"" Issues 1881-1887 - The Brian Moorhouse Collection"
9139 "Louis, Karl, FRPSL (exhibitor), author of the family and company history: Wolfgang Maassen RDP FRPSL" CHE "EDITION SPÉCIALE - Switzerland - Vol. I - Cantonal and Federal Administration 1843-1860 - The Jack Luder Collection"
9140 "Louis, Karl, FRPSL (exhibitor), author of the family and company history: Wolfgang Maassen RDP FRPSL" CHE "EDITION SPÉCIALE - Switzerland - Vol. II - Cancellations 1850-1854 - The Jack Luder Collection"
9144 Maassen, Wolfgang, RDP FRPSL DEU "The mysterious Philippe de Ferrari . Collector, Philatelist and Philanthropist / Philippe de Ferrari, cet inconnu: Collectionneur, Philatéliste et Philanthrope"
9146 Maassen, Wolfgang, RDP FRPSL DEU "Ein weltweit einmaliger Verband. 50 Jahre Bundesverband Deutscher Briefmarken-Versteigerer (1968–2018)"
9149 "Michelson, Dieter, FRPSL (exhibitor), author: Jonas Hällström RDP FRPSL" DEU "EDITION D'OR Vol. 45 - Square-Rigged Sailing Vessels - The Jonas Hällström Collection"
9150 "Michelson, Dieter, FRPSL (exhibitor), author: Birthe King, FRPSL" DEU "EDITION D'OR Vol. 46 - Denmark: Conscience, Conflict, and Camps 1932-1949 - The Birthe King Collection"
9152 "Michelson, Dieter, FRPSL (exhibitor), author: Geoffrey Noer" DEU "EDITION SPÉCIALE - Faroe Islands Postal History 1751-1948 - The Geoffrey Noer Collection"
9153 "Michelson, Dieter, FRPSL (exhibitor), authors: Kersti and Bertil I. Larsson RDP FRPSL" DEU "EDITION SPÉCIALE - Sweden - Postal History until 1880 - The Kersti and Bertil I. Larsson Collection"
9154 Michelson, Dieter, FRPSL & Louis, Karl, FRPSL (exhibitors), author: Hotze Wiersma CHE "EDITION D'OR Vol. 51 - Postal Services in the Rural Areas in the Netherlands before 1850 - The Hotze Wiersma Collection"
9155 Michelson, Dieter, FRPSL & Louis, Karl, FRPSL (exhibitors), author: Michael Mahler NLD "EDITION D'OR Vol. 53 - U.S. Civil War Era Fiscal History Panorama - The Michael Mahler Collection"
9156 Michelson, Dieter, FRPSL & Louis, Karl, FRPSL (exhibitors), author: Erivan Karl Haub USA "EDITION SPÉCIALE - Postmasters´ Provisionals - United States and Confederate States - The 'Erivan' Collection"
9159 "Pirc, Igor (Exhibitor), Authors: Igor Pirc and 14 other authors" SVN "Proceedings of the international symposium - 100th anniversary of the Chainbreakers - the First Slovenian Postal Stamps"
9163 "Schwanke, Hans-Joachim (exhibitor) / author: Jakubek, Wolfgang" DEU "Thema 3. Reich - ein Bildband und Erinnerungen Third Reich Theme. Memories and illustrated Handbook) - 2 Volumes("
9168 Turgut, Turhan, FRPSL TUR "Turkish title: Osmanlı İmparatorluğu Posta Tarihi - Tarifeler ve Posta Yolları (1840-1922) / English title: Postal History of the Ottoman Empire - Rates and Routes (1840-1922)"
9169 Wewer, Heinz DEU "Postalische Zeugnisse zur deutschen Besatzungsherrschaft im Protektorat Böhmen und Mähren (Postal Documents on the German Occupation Regime in the Protectorate of Bohemia and Moravia)"
0150-0154 Frazão Luis RDP FRPSL PRT 5 "Crown stamps and covers from the Portuguese Colonies (1870/1889). Part 2 - East coast of Africa, India and the far east"
0290-0297 Rodin Igor RUS 8 Space Mail from "Salyuts" to "Mir"
1158-1162 Gliedman Chip USA 5 My Victoria - Imperforate Line Engraved Stamps of G.B. from Plate Position "CG"
1163 Gwynn Robin RDP FRPSL NZL 1 New Zealand: The 1881 Act and the "1882 Provisionals"
2128-2135 Butterline Mark USA 8 Falklands or Malvinas? 2177-2184 Donaldson Wayne AUS 8 Sweden & Great Britain: Mail Connections till U.P.U. 2202-2209 Ferdén Staffan SWE 8 "Carte Postale" - The postcard as a mean of communication over time, from Sweden to abroad during the first period 1872-1939"
2286-2291 Gudlin Tamas DEU 6 From "Roller" to "Flyer": Early Milestone-Innovations in Postmarking 1851-1890. 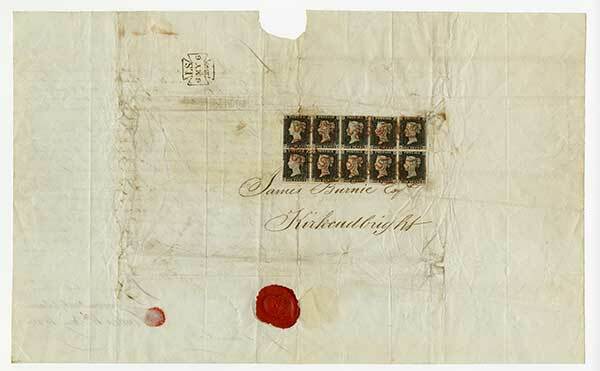 2420-2427 Krug Hansmichael DEU 8 "Postverkehr zwischen dem Gebiet der Deutschen Reichspost und den Vereinigten Staaten von Amerika 1871-1875"
2570-2577 Nilson Kjell FRPSL SWE 8 Swedish Postal History 1939-1948 "The Swedish Mail and the War"
2642-2646 Rothwell Alan GBR 5 Tristan da Cunha "A Life in Exile"
6103-6110 Sole Brian FRPSL GBR 8 Go by cycle! 7067-7074 Winters Graham FRPSL GBR 8 "A Good Walk Spoiled"
The Palmarès will be conducted as the official banquet of STOCKHOLMIA at the Vasa Museum Saturday 1 June at 7.00 p.m. The STOCKHOLMIA BANQUET will take place the fourth evening of the exhibition, on Saturday 1 June at 7.00 p.m.. The banquet is the official dinner of STOCKHOLMIA 2019, will cover the main awards ceremonies and will be open by ticket to all guest to STOCKHOLMIA 2019. The STOCKHOLMIA BANQUET will take place at the Vasa Museum, for many years one of Stockholm’s most magnificent dinner venues, in the shadows of the grand ship Vasa. A truly unique experience – leaving you with everlasting memories. 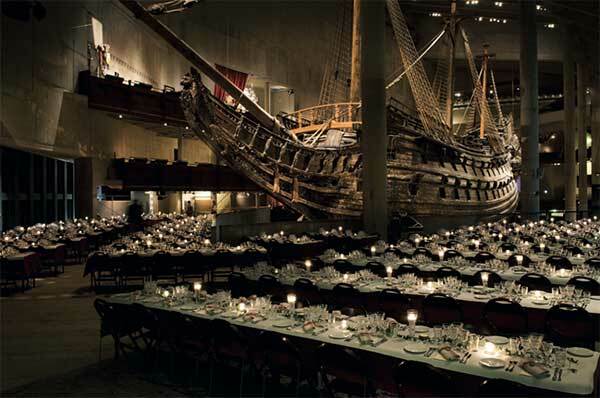 To have dinner inside the Ship Hall, next to the warship Vasa is something you don’t want to miss. It is the ultimate experience of Swedish History combined with the finest food and drinks. This will be a memorable evening filled with Swedish History and traditions – you will definitely leave the Vasa Museum with a long lasting smile! The tickets to the Palmarès will be offered from 2018. 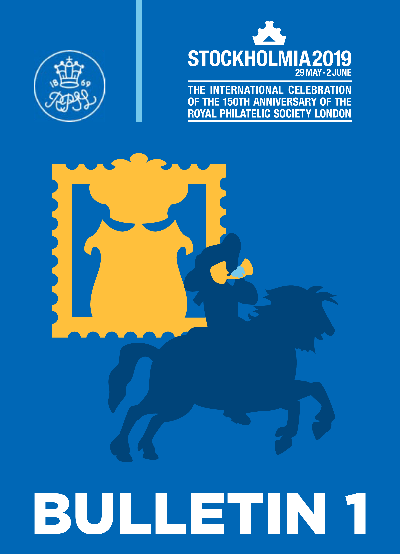 The international jury represents 14 different membership countries of The Royal Philatelic Society London: Australia (2), Argentina, Canada, Colombia, Denmark (3), Finland (2), Germany, Hong Kong, Japan, Norway, Slovenia, Sweden (4), United Kingdom (5) and USA (4). The selection is based on certain criteria and the jury is approved by the Council of The Royal Philatelic Society London in coordination with the ABPS (Association of British Philatelic Societies Ltd.).